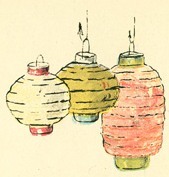 This free copyright free image of Japanese paper lanterns might be vintage but it looks very much like today’s modern clip art. Anyone looking for lighting images or images or paper lanterns can download and use this image in their projects for free. My Toy ABC included this and a variety of other drawings. It was published around 1880 without identifying an author or illustrator.